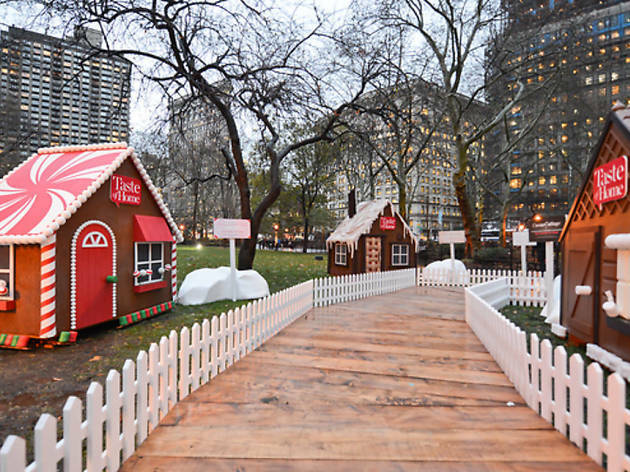 Madison Square Park will transform into a scene straight out of "Hansel and Gretel" as Taste of Home's Gingerbread Boulevard two-week installation returns Dec 6! Wander down to the life-size gingerbread house and ogle—no, salivate—over the candy-covered crib built with ginger “bricks," which is topped with a “frosting-covered” roof and adorned with peppermint sticks, gum drops and more. Better yet, you can actually go inside this house to check out virtual and interactive elements such as a marshmallow snowman and decorate a Christmas tree. Once again, this event is sponsored by Folgers. Last year, folks were able to sip complimentary java while munching on M&Ms, Twix, Snickers and Dove chocolates. In case these treats aren’t available this year, you may want to bring munchies. (Y’know, to keep you from nibbling the scrumptious house). 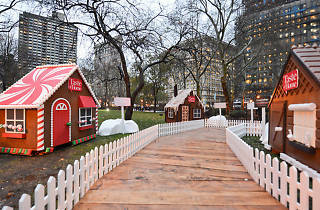 The gingerbread house will be open to the masses before Madison Square Park’s tree-lighting ceremony at 4:30pm on Dec 6 and will remain on-view through Dec 18 (Mon-Fri 2-8pm; Sat, Sun noon–8pm). Don't do this - it's so so lame!! It's only one house, and the wait is like 45 min in the freezing cold. Inside of the ginger bread house is a bare room made of plywood with Folger's ads and gingerbread animations projected on the wall. Photo is pretty misleading--this year there's one house. And it's just some video screens! Tourist (or gullible parent) beware! Complete waste of time. It's only one house. Nothing as described. Went last night and it wasn't even open. This is really deceptive. It's only one house with a line that even the security guard said it's not worth going into. You move some things on the wall and it smells like gingerbread.....not a village! There is only one gingerbread house and if the line is long it isn't woth going inside for 5 minutes.